Dreams surely do come true when you think it, believe it and work towards it. This particular story of Gabriel Jesus is another example of that testimony. These pictures of Gabriel Jesus (seen above) have been trending over social media and the reason is very obvious. 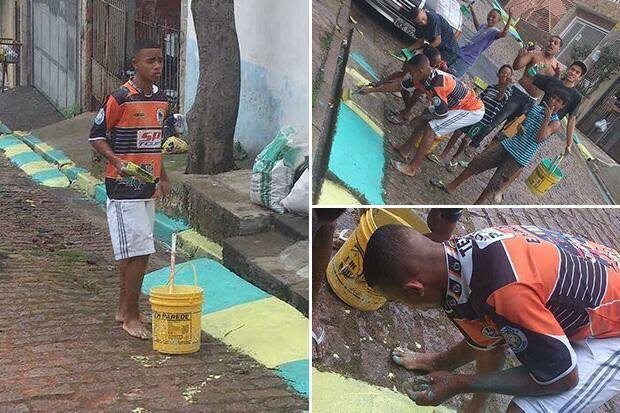 Four years ago, Manchester City striker, Gabriel Jesus was a regular street boy, painting the streets in his country in preparation for the Brazil 2014 World Cup. On Sunday (June 2018) Gabriel Jesus was a star in Brazil’s first match against Switzerland at the ongoing world cup in Russia. The viral pictures from 2014 show a 17-year-old Gabriel Jesus, brush in hand, helping to paint the street where he lived as World Cup fever swept Brazil. Four years on, the 21-year-old is no longer the painter but the painted. It has been a meteoric rise for a player whose £27 million move to Manchester City from Palmeiras in January last year introduced an European audience to a talent on which Brazil are pinning so many hopes. He helped Manchester City demolish a series of records en route to lifting the Premier League title and now he’s in Russia trying to help his country. Now, several adjoining houses in Jardim Peri, the Sao Paulo neighbourhood where he grew up, have been painted with an image of Gabriel Jesus performing his now familiar goal celebration, where he pretends to phone his mother, Dona Vera, his biggest fan and harshest critic.